Overview: In this class with excellent instructor to student ratio, students have the option to customize this course to fit their requirements and modify the time from 3 days to 5 days. Customization may include: custom tutorials and custom models, or making the workshop more specific to plastics, industrial design, capturing form, or proving form. Projects: Based upon participant’s interests or job requirements. Whats Next: Solidworks Surfacing Week, Plastics Part Design, Die Cast Part Design, Mold Design for Plastic Injection. Similar Course: Manufacturing Week long Intensive, Plastics Part Design, Die Cast Part Design, Mold Design for Plastic Injection. Using 3D Curves and 2D curves. Projection, split line, composite curves. IGES and STEP imports and exports. Surface Offsets and Copy Move functions. Extending Surfaces, Surface Trims and Knits. Managing Sweeping surfaces as Draft on complex Sweeps with respect to plastic part design. Learning to create special tool curves and surfaces that will help manage surface geometry manipulations. 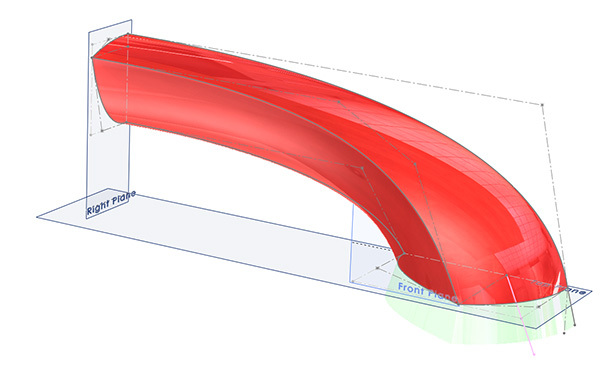 Projecting curves onto surfaces and and intersect surfaces to obtain curves. Learn to build geometry with those resultant curves. Using the 3D curve tool to sketch spine on surface. Import images to sketch over. Sharing examples from Freeform & Dent Tools. Discussing surfacing methodologies with respect to Alias Studio and Rhino modeling techniques. Learning techniques using surfacing of forcing rounds onto solid geometry. Learning to create geometry slated for production and to use parting surfaces for generating parting lines on production parts. Discuss Mid-Surfaces as a technique used with top down design. 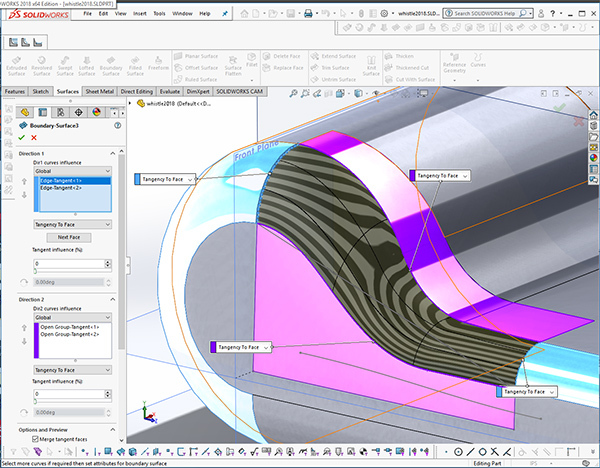 Introduction to G1, G2 Continuity and light reflection with respect to product design and SolidWorks surfacing. 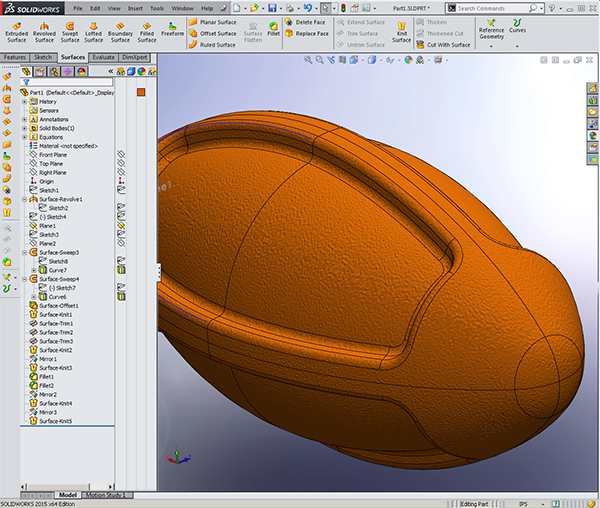 Discuss with examples three methods for Top-Down Design using SolidWorks. 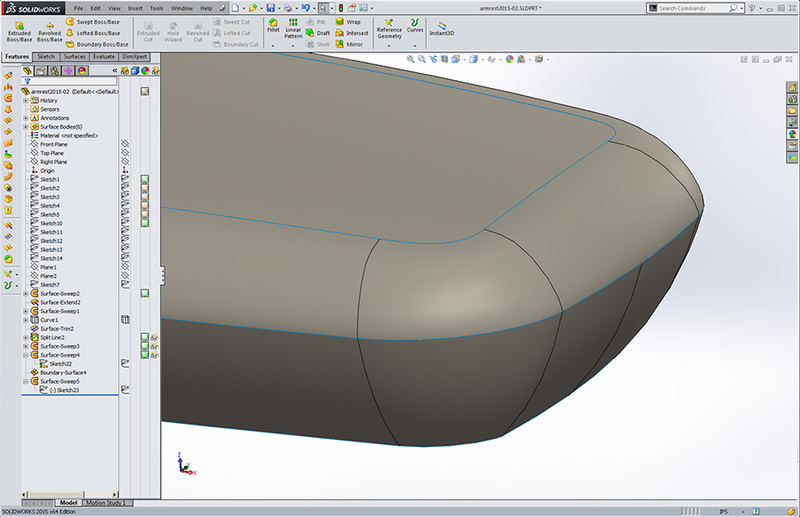 Share SolidWorks options for optimizing a proving form methodology while surfacing. 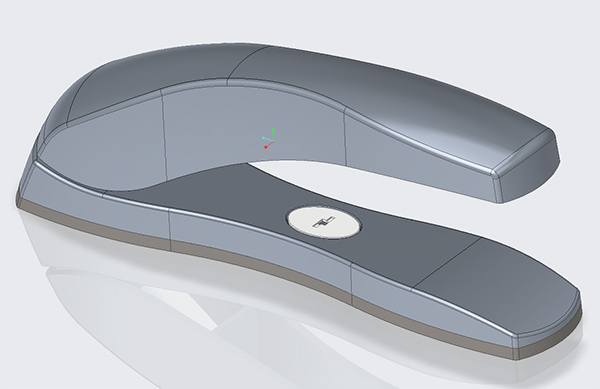 Introduction to constraint based modeling with parametric curves, surfaces, and making changes utilizing the latest release of SolidWorks. This SolidWorks surfacing training course is developed for new and seasoned users who want to become proficient SolidWorks surface modeling in just three days. We help you learn SolidWorks, not read to you from a book or exercise. In this course we teach design engineers how to make changes quickly to set them up for becoming expert faster. As with all Design-Engine classes, participants keep the training material login and password for life.